The preset location address: Cleveland Airport, 18809 Maplewood Avenue, Cleveland, Oh 44135, USA, area 'Cleveland - Airport'. -by using the Cleveland interactive map on the left. Rental service. At the airport of Cleveland, OrangeSmile.com provides cars to rent in all categories: economy, compact, full-size, minivan, SUV and cabrio. Renting a car in the airport is always cheaper than in other rental locations around Cleveland. Reservation. When filling in the reservation form, always specify your flight number to Cleveland. This helps our rental supplier to control the car logistics based on the actual flight landing time. Also, read the car rental conditions carefully. They specify the required documents to be brought to the desk in Cleveland - Airport. Finding the office. Upon landing follow the signs 'Car Rental' to find the rental location 'Cleveland - Airport'. These signs can be found in the baggage area and in the arrival hall of the Cleveland airport. Communication. Keep the phone numbers of our support team and the rental office in 'Cleveland - Airport' with you during the trip (both numbers are provided in the confirmation voucher). In case of any deviations from the plan or delays, please make a notification call to the rental desk as soon as possible. In case of problems at the 'Cleveland - Airport' office, make a live phone call to our support. At the office. Ask your rental officer in 'Cleveland - Airport', whether it is possible to upgrade the vehicle. Often, rental companies of USA use the opportunity to make the customer happy by an upgrade. Also ask for telephone numbers to be used in case of car damage or theft situations. Return. At the rental desk in 'Cleveland - Airport', ask the officer how tolerant the rental company is to the 'too-late' returns. Normally, a one hour delay is not penalized in USA. We wish you great holidays and fantastic time in Cleveland! 'OrangeSmile.CarTrawler' enables advanced search through the most complete and up-to-date database of actual car rental offers in Cleveland, as well as an instant 3-step reservation service for your selected vehicle. All the booking stages, including the confirmation voucher, are provided in most common languages, including English. We guarantee that regardless of your rental dates, at the location 'Cleveland - Airport' you will always find a car at a price that will be lower than in other rental companies. Cleveland Hopkins International Airport is situated 14 kilometres from the central business district of the city. This civilian airfield serves as the main commercial hub of the state. 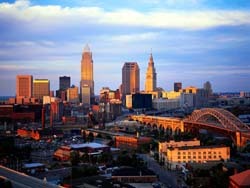 It is entirely located within the city limits of Cleveland. Cleveland Hopkins International Airport was built in 1925, and got its modern name in honour of the former city manager of Cleveland in 1951. It was one of the first airports to have air traffic control services, runway lighting system and to be directly connected to a rail transit system. The international airport operates three runways and one passenger terminal, divided into several concourses, which are A, B, C, and D. It services about 11 million people every year. Bus number 22 connects the city centre with the airport at night. The rapid transit system connects the station beneath the passenger terminal (entrance through the escalators and elevators from the baggage claim halls and the ticket offices) and the RTA's Red Line. At the airport, you can take advantage of taxi, ride-share (the Ground Transportation Centre), limousine rental and car rental services. The taxi rank is positioned at the exit from the baggage claim hall (the orange wall). The exit is found opposite Baggage Carousel 11. You should book a limousine in advance. Car rental services are provided in the consolidated rental car facility at the following address: 19601 Maplewood Avenue, Cleveland, OH 44135, access from W 192-nd St. Several car rental companies operate in the consolidated rental car facility. These are Alamo, Avis, Budget, Dollar, Enterprise, Hertz, Nationalcar, and Thrifty. A shuttle runs regularly from the passenger terminal building to the consolidated rental car facility and back. The shuttle departs from the doors of the arrival area (Baggage Carousel 7). Going from the consolidated rental car facility, the shuttle arrives at the arrival level (door 4). The shuttle service operates round the clock. Furthermore, you can get to the consolidated rental car facility by shuttle departing from the Ground Transportation Centre, placed opposite the terminal. A telephone and the contact information for the car rental offices are available in the baggage claim area. Some companies, such as Budget, offer unlimited daily mileage to their customers, and cooperate with Miles & More programme. There is no short-term free parking at the airport. Parking facilities include Smart Parking Garage (connected to the terminal by walkways), valet parking (found in Concourse A of the terminal), long-term parking lots, and an economy parking lot (a shuttle runs from it to the Ground Transportation Centre, across from the terminal). The Sheraton hotel is nestled in the territory of the airport. The hotel offers free parking to its visitors. The nearest hotels, which provide a free shuttle service from and to the airport, are the Aloft, the America's Best Value Inn, the Bertram Inn-Aurora, the Best Western Brookpark, the Cambria Hotels and Suites, the Courtyard by Marriott, the Doubletree, and the Embassy Suites.